An intuitive interface combined to a high-end audio engine are the core of CROSS' build. 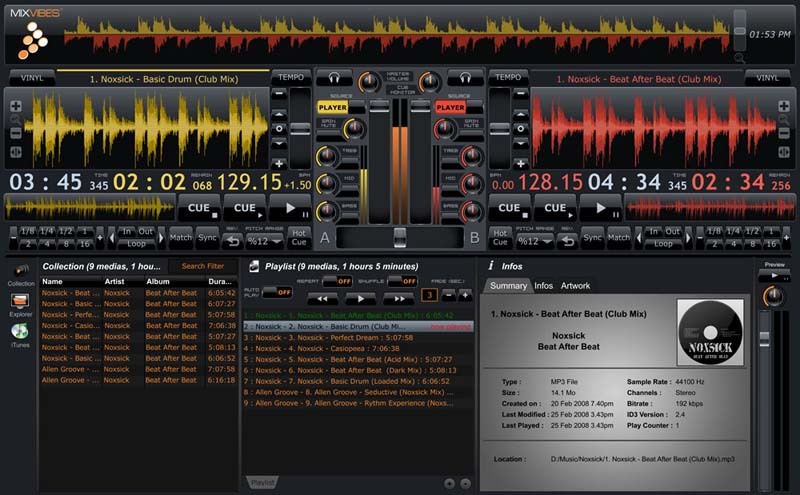 To make the DJs job painless, the interface displays all the standard professional DJ tools in the places you would expect to find them: manual and auto loops, BPM analyzer, BPM matcher and locators are easily visible and editable. MixVibes CROSS brings an answer to all the DJs who are concerned with the loss of sound quality induced by the widespread of digital sound. On the interface side, a �summary� tab displays a detailed overview of the media encoding quality. Last but not least, the "Z-plane" master tempo technology allows +/- 20 BPM variations with virtually no sound distortion, while the exclusive hybrid mode ensures a smart transition between Master tempo and Speed mode to avoid digital distortion at extreme pitch values. DJing various styles and BPMs without compromising on sound quality becomes fun and easy! Construct, solve and output professional-quality crosswords. Fun crossword game for 1-4 players. Convert TrueType and PostScript Type1 fonts between Macintosh and PC. Is a game you can belong to the category of classical clicking games. Qweas is providing links to CROSS 1.1.3 as a courtesy, and makes no representations regarding CROSS or any other applications or any information related thereto. Any questions, complaints or claims regarding this application CROSS 1.1.3 must be directed to the appropriate software vendor. You may click the publisher link of CROSS on the top of this page to get more details about the vendor.